When Siri was introduced just last month, it didn’t take long for developers to tinker with the software and find innovating ways of using the feature. We reported how one creative developer introduced a local proxy server enabling Siri with extra commands –to adjust a Wi-Fi enabled thermostat, for example. The rather surprising application made room for other new ideas. Another developer was even able to start his car using the new server. Today we have learned how yet another developer has extended the boundaries even further. In this case, he has used the proxy server to swap between videos on his TV. Be sure to check out his video below. He has movies and shows saved and streamed through a Plex server. He then asks Siri to play a specific show by naming the season and episode number or by simply asking Siri to play the latest episode. Once the command is given, Siri will start the show or movie on your TV almost immediately and will confirm it by naming the show’s title. 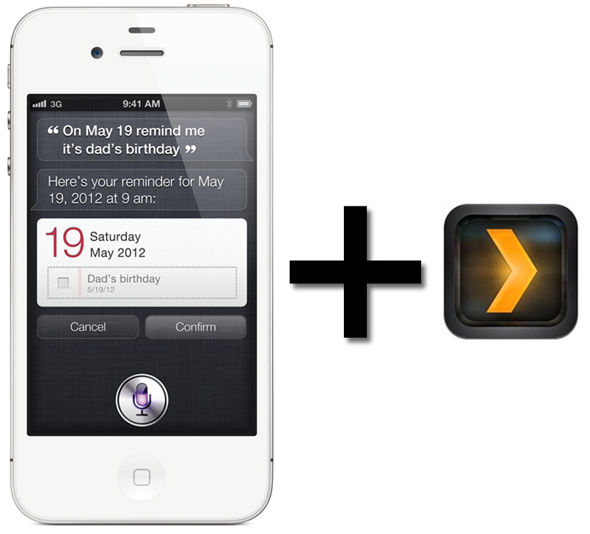 If an episode or video is not on the Plex server, Siri will let you know the video is not found. Plex is a pretty cool media server; I have used it on my jailbroken Apple TV and it’s quite useful in streaming non-Apple movie files. The only drawback: having to use the tiny Apple remote to surf through the catalog. This new interface would make things a whole lot easier. Unlucky for us, the recent Apple TV update (4.4.3) made Plex incompatible. If you’re a current Plex user on the Apple gadget, make sure to verify there’s a working version before installing any update. The technology behind Siri is mostly done on Apple’s servers. Access is not given to third party developers, at least not yet. Maybe one day we’ll see Siri being used in more than just our iPhones but apps as well. I wouldn’t mind controlling my TV or even my Mac by voice either.